It is common that many parents want their young children to learn techniques of self-defence so that they will be more self-confident, self-reliant and better able to deal with the ever present bullying at school. Aikido could be a great tool for learning conflict resolution, as well as teaching self-improvement, Aikido encompasses practical techniques to preserve integrity and promote cooperation. That is why some people have used the techniques of Aikido as a metaphor for teaching the skills of mediation and conflict resolution. 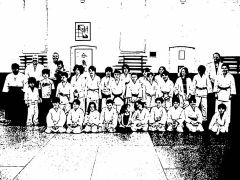 The general aim of the practice is to open children up to the humanitarian and engaging principles that underlie the practice of Aikido while developing their physical and emotional stability. Our classes consist of warming-up exercises, basic movements that form the building blocks of Aikido, more advanced techniques, and some more playful exercises which enrich the skills developed. The children train in a lively, healthy and relaxed atmosphere that they enjoy, yet the purpose and the skills are always serious and real. The students work with the instructor and with each other. A great deal of the class training is with partners and the children learn how to trust each other and how to help each other. Comply with appropriate training standards for what constitutes safe practice in exercise. Understand our responsibilities under Occupational Health and Safety regulations. Understand our responsibilities in dealing with complaints involving sexual harassment and discrimination in the martial arts industry. Have a current Working with Children (WWC) Check. All our instructors have many years training in Aikido in addition they have broad experience liaising with children either as School teachers, Sport Coach or Parents which is added to their passion towards teaching aikido to your child. Children's classes coincide with Victorian School Terms - more information on these dates is available here.